Small town newspapers usually have community columns that covered the lives of the local folks. Sometimes known as "gossip columns", they were written by a local resident who collected the goings on of nearby families, clubs, and other groups. These columns can provide interesting glimpses into a family's community life . The internet has made searching for these glimpses much easier. Many New York State Papers are now online at www.fultonhistory.com. The Cook Family lived in Hemlock NY from around 1959 to the early 1970s. You will find below a sampling of some of the times we made the "news". They are in chronological order. If you want to see more - go to fultonhistory.com and in the search box put in a family member name and Hemlock (or any other communities you want to look in. Make sure you are looking for "all of the words". I have included a sample below. The family got into scouting soon after we moved to Hemlock. 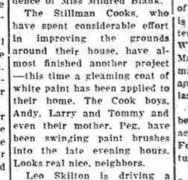 Dad (Stillman Cook) was on the boy scout committee. Andy was a boy scout and when I was old enough, I became a cub scout. 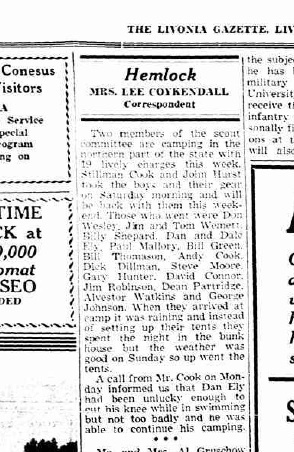 According to this article, Dad and another man took the scouts camping "in the northern part of the state." This was undoubtably the Adirondacks probably south the St. Regis Mohawk Reservations. The troop probably went to Ray Fadden's place in the Mountains. Ray was a family friend who had a Mohawk museum in the woods. This was the notice of the marriage of Gary Cook to Pat Dillman. I don't remember the wedding, but I do remember the reception that we held at our house. It appears they stayed with us for a while. I can also remember this anniversary party. At lot of relatives came including several of Dad's brothers. There were lots of kids and we spent most of the time playing outside. They were given a "silver dollar" tree - a small shrub of some kind that had lots of silver dollars attached to it. Made quite an impression on a nine year old. I think Gail and Mickey stayed with us when George was getting his degree. The dogs name was Mogo, and he lived at the southeast corner of the house. He had a dog house, and a long chain that allowed him some room to run. I was eating breakfast when Mom went out to see what was wrong with Mogo. I remember hearing her yell - and looking out the window and seeing her and the dog tangled up, both in distress. Luckily our neighbor John Hendrickson was already on his way to help. Mom was very sore for a long time and never forgot the incident. I didn't know until I found this clipping that it had made the local papers. There are two mentions of the family in this article. In the first column, Andy is coaching the cub scouts in baseball. He would have been 16 at this time. The Hemlock School was just a few houses away from where we lived. I was probably one of those cub scouts. In the second column Mom and Dad went to the city for Grandpa Allen 's retirement party. Andy probably babysat me and made one of his great pizzas! I do remember bits and pieces of this vacation, especially visiting our old Hemlock neighbors, the Armstrongs. But I remember the incident with a car door more clearly than anything else. I still have a "funny" finger nail on my right hand from catching my hand in the door. I guess I was accident prone. I think I remember some of this painting party. I don't think we finished the back of house of the house that summer, but I am sure that we had more paint on us than on the side of the house. This may have been the time one of the cats got into white paint and walked around inside the house. My musical instrument case had white paw prints on it for as long as I owned it. 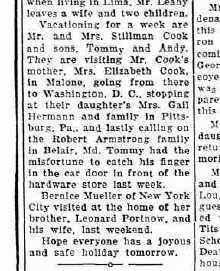 The person who was writing the column was Mrs. Portnow, who lived across Main Street in Hemlock from us. I think that is why we made the news fairly often. 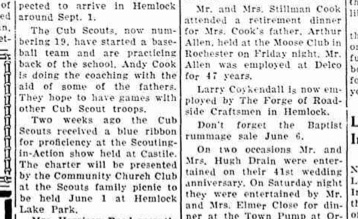 Dad worked with scouts as long as Andy was in the troop, and I believe might have taken the scouts once camping on Hemlock Lake after I moved up from Cub Scouts. Mom loved her Cub Scouts and continued to be a Den Mother even after I moved became a Boy Scout. 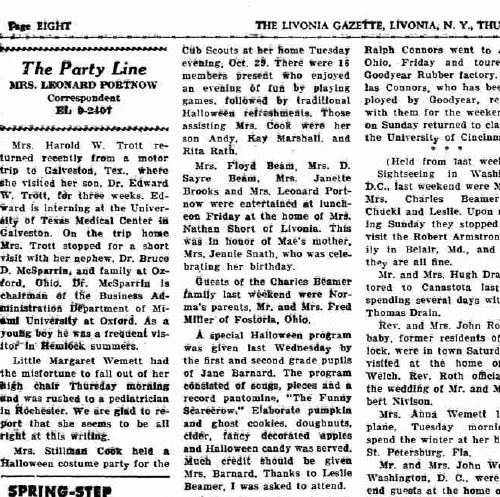 At the bottom of the first column it tells about a Halloween party for the Cubs she had at our house. The games included spoon races (I think with eggs) and bobbing for apples. Kay Marshall and Rita Rath both had boys my age in the Den. This is one of the many advertisements you will find for Dad. 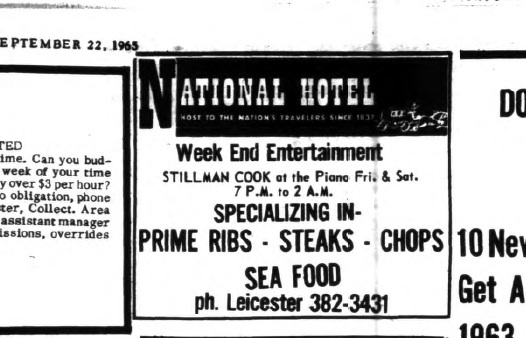 "Cookie" played at the National Hotel in Cuylerville, and also later at the Avon Inn and the Valley Inn in Honeoye. He also worked full time at Kodak, and delivered fish for Palmer's Fish market. I think he did his fish route through Naples, Wayland, Springwater, a couple of times a month. This ad came from the Livingston County News in 1965.